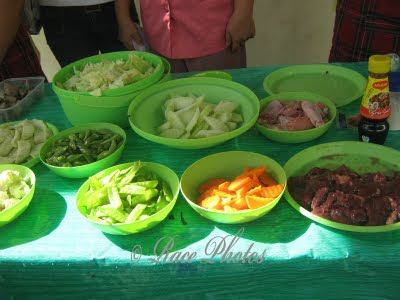 This is the entry of Grade 6 level in Nutritional Foods Competition in last month's celebration of nutrition month. I've enclosed a picture detailing the basic ingredients used to cook this very healthy and delicious chopsuey, well for me it's really yummy as I love veggies especially chopsuey. I also cook chopsuey in my house but I don't put chicken on it. I used chicken liver as the meat ingredients and breaded chicharon tofu to put on top and all over the menu. Anyway as they cooked beside us we exchanged plates to them to taste their food. It's delicious and veggies are nicely cooked without overcooking. They got the second place though I think my chopsuey recipe is more economical and healthy because of the tofu ingredients (Just an opinion :-)). More nutritional foods on succeeding weeks ahead. Happy Food Friday to all, see other yummy foods here! 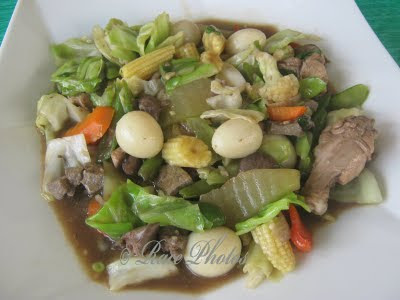 i like chopsuey, too, with liver. Sayang naman! Why 2nd place lang when it looks so deliciously good! Race, i think I'll copy your recipe of using tofu instead of chicken. I do agree w/ you that it's much better. Cheaper na nutritious pa! Weekend na naman! Have a great one! I haven't tried cooking chopsuey with tofu. I'll definitely experiment on that one of these days. Quail eggs and young corn.. favorite ko sa chopseuy! My FF posts are HERE and HERE. Happy weekends! Namiss ko ng kumain ng chopsuey. That's my ate's fave at kung sya ang nagtreat sa amin cguradong meron nyan. winner pa sa akin yan! I love chopsuey too! Siguradong healthy dahil sa veggies!